Is this Pro simply a rebranded Standard or an upgrade? For the everyman player, it's the latter. Upgrades from American Standard spec; new bridge and pickups; a great workhorse contemporary Telecaster. Its middle-of-the-road spec may be a little bland for some. 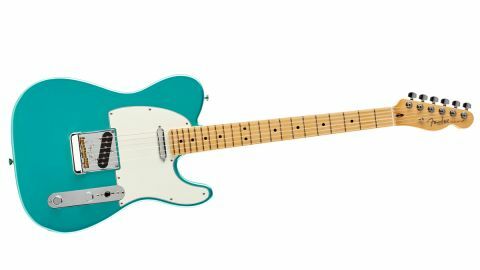 Can it really be 31 years since the American Standard range relaunched the Fender ship and laid the foundation for today's über brand? Well, yes, but as of 2017, the American Standards are dead. Long live the all-new American Professional series. There are nine guitars in the new guitar range: Strat, Tele, Strat HH, Strat HSS, Telecaster Deluxe, Jazzmaster and Jaguar, plus Strat and Tele lefties. But while the name is new, there's plenty here that's inherited from the Standard platform, such as the flattened 241mm (9.5-inch) fingerboard radius and the two-post vibratos. The Professionals, just like the Standards before them, are designed to appeal to a wide range of players with a wide range of styles. These are not for vintage obsessives. Most of the changes are relatively subtle: a new 'modern deep C' neck shape; new narrow/tall frets; and the Teles revert back to three (compensated) brass saddles over the previous six Strat-style saddles. And, oh yes, we've got new colours, too: Sonic Grey, Antique Olive and Mystic Seafoam join the ranks. The new Pro range introduces three new colours (Sonic Grey, Antique Olive and Mystic Seafoam) but your choice of body type (ash or alder) is limited; less so, the fi ngerboard material (maple or rosewood). The Strat with ash body is only available in Sienna Sunburst; likewise the HSS - both have either maple or rosewood 'boards. It's alder-only on the HH, while the Tele, as you'd expect, has an ash body on Natural, Crimson Red (rosewood) and Natural 2-Colour Sunburst, Butterscotch Blonde and Mystic Seafoam (maple). The alder choices are wider on the Strats with 3-Colour Sunburst, Olympic White, Black, Sonic Gray and Antique Olive (all with either maple or rosewood 'boards). The alder HSS comes in 3-Colour Sunburst, Black, Sonic Gray and Antique Olive (rosewood), with a maple-'board Olympic White replacing Sonic Gray. The HH is only offered with rosewood fi ngerboard in 3-Colour Sunburst, Olympic White, Black, Sonic Gray and Antique Olive. Alder-bodied Teles are available in 3-Colour Sunburst, 2-Colour Sunburst, Black, Natural, Butterscotch Blonde, Mystic Seafoam (maple); 3-Colour Sunburst, Olympic White, Natural, Crimson Red Trans and Sonic Gray (rosewood). All the American Pro Series guitars have a gloss polyurethane body with satin urethane on the neck back and gloss urethane on the headstock face. Both single coils here use Alnico 5 rods on the bass side and Alnico 2 on the trebles and, like the Strat, we have that treble bleed RC network on the volume. There are no other wiring tricks. As we mentioned, though, the return to three brass saddles is much more 'traditional Telecaster': these are nicely compensated and offer slightly wider string spacing than the Strat's bridge and, on closer inspection, it's actually part of a completely new bridge design. The half-walled bridge plate subtly aids palm muting, plus the partial 'ashtray' cover push-fits over the intonation screws and is both comfortable as a palm rest and adds an unusual yet nicely retro appearance. Of course, like the original cover, you don't have to use it. Also, the bridge plate is screwed down at its top edges - a trick many a player has added to help prevent microphonic feedback. As a result, the bridge plate is a little longer and wider: 88.7mm long by 82mm wide. In comparison with the recently-released Professional Series Strats, here we get that very slightly fuller feel to the neck and a basic trio of sounds that shouts 'contemporary Tele' from the biting harmonically rich honk of the flat- pole bridge, through the wider, less quacky pickup mix, to the less hard-hitting but not soft neck voice. Like the Strat, it's like someone has EQ'd the sound to balance and maximise its Tele-ness. There's a very lively ringing resonance, too: all the planets seem to align, the maple neck/alder body perhaps pulling down a little edgy spike, while those brass saddles - not to mention the through-body stringing and the more classically voiced pickups - combine to create what seems like a modern Tele in spec but one that has plenty of classic, vintage reference. The colour/wood choices are wide and the subtle improvements to the build - on an already very well proven chassis - make a noticeable change, not least the new neck shape and the taller fretwire. Yes, we've played thicker, beefier-sounding Teles, and thinner, brighter ones, too, but as a foundation tone, which also includes a very smart and practical, lightweight moulded case, it all becomes a bit of a no-brainer.